Students of Ramagya School who were selected in the Pre -U.P shooting tournament held in Ramagaya School in collaboration with Shootex Academy participated in the Pre-National Championship held at Chennai from 31st August-7th September 2018. Keeping up with the shining streak of winning, students of Ramagya and Shootex Sports Academy excelled in Pre-National Championship in 10M Air Pistol Event. Prateek Yadav, Satendra Yadav, Vikas Bansal, and Saurav Verma were selected for the National Championship for shooting to be held in the month of November. Vikas Bansal won a silver medal in the event. 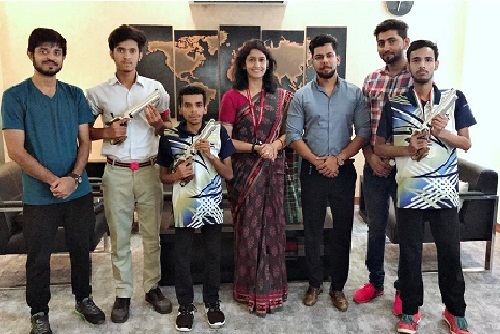 The Managing Director -Mr. Utkarsh Gupta and Principal Ms. Aparna Magee congratulated the students and their coach Mr. Nitin Chaudhary and extended their best wishes for the upcoming National Championship.